Summary：This chapter will expose the why China was able to become number one in global transplants using reversed tissue typing. As we shall show, estimates based on reversed tissue typing concludes that in order to accomplish the number of organ transplants publicized officially, over 100,000 donors are needed for tissue typing–essentially, a huge live organ reservoir. That number is not compatible with the argument that death-row prisoners served as the source of organs. Falun Gong practitioners (and to a lesser extent Uyghurs and Tibetans) secretly detained in camps are the main plausible source, yet in the current conditions of an information blackout, it is hard to obtain the evidence of those secret camps. However, Falun Gong practitioners detained in prisons, labor camps, detention centers, and at home have been forced to have blood drawn on a large scale, which indirectly proves the existence of live organ reservoir for tissue typing. I. During the Interview on March, 2015, Huang Jiefu Admitted Tissue Typing is Practiced in China. The CCP has Lied in Claiming that Death-Row Prisoners are the Sole Source of Organ Transplants. Because of the wide coverage of medical insurance, the cost of organ transplant in most nations are covered by national medical insurance systems. Therefore, the donors are matched against a large number of patients in need of organ transplant for tissue typing. However, in China, due to the large income gap and the lack of medical insurance, among the over 300,000 patients in need of organ transplants, few of them can afford the expense. Huang Jiefu denied that Falun Gong practitioners have been slaughtered for organs while freely admitting that death-row prisoners were being used as organ donors. On one hand, the CCP has been claiming that a large number of patients, 300,000 to 1,500,000, are in need of organ transplants. On the other hand, the CCP has been trying hard to conceal the real number of prisoners sentenced to death since this information is treated as a state secret. Nonetheless, even the most conservative CCP officials agreed that after 1998, the number has not exceeded 10,000. If those death penalties can be matched against 300,000–1,500,000 for organ transplants, 6,000–10,000 cases of kidney transplants and about 3,000 cases of liver transplants could be conducted. 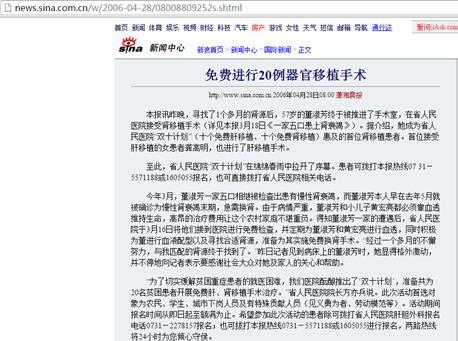 It seems that the CCP can manage to explain the number of organ transplants. However, in March 2015, Huang Jiefu contradicted his previous numbers when being interviewed by Phoenix Satellite Television. He said that due to the cost of surgery, in China, the number of people waiting for organ transplants should be 22,000 instead of the 300,000 patients in need of such procedures. Huang’s words indicated that China practices reverse tissue typing, in other words, actively finding a match for the 22,000 patients among a certain number of donors. Thus, the number of death-row prisoners are far from enough as such a practice demands a huge live organ reservoir. A simple calculation can help readers to understand how the lie has been revealed. 1) Assuming that prior to 2006, there are 10,000 death penalties, 20,000 patients can afford organ transplant surgery, and the tissue type matching rate is as high as 20-30 per cent as claimed by the CCP, 4,000–6,000 kidneys can be used if the physical condition of prisoners are not an issue and all of them can be used for tissue typing. 2) However, the number of kidney transplants reached 10,000 in 2004, according to CCP’s official publication, far exceeding 6,000. Because there were barely organ donors and live organ transplants at that time, the published number of organ transplants revealed that CCP had committed a massacre. 3) Furthermore, the number of death-row prisoners used for organ transplants should be much less than 4,000–6,000 due to the health condition of those prisoners (particularly the high rate of hepatitis), the management of those prisoners by different local judicial systems, the possibility of appeal by families of the prisoners if they find organs are missing, the short life-span of organs once removed from the body, and the time between the prisoners being executed and the surgery for the patient. Those are reasons why in 1998, organ harvesting peaked at only 3,700 cases. 4) The techniques of kidney transplant were well developed before 1998. Due to the factors stated above, the use of death-row prisoners for organ transplant was very stable. After 2000, the publicized number of kidney transplant exceeded 5,500 every year. It is evident that the organs were obtained illegally. Based on statistics summarized by WOIPFG on organ transplants performed in different hospitals, we believe that by December 2014, the total number of organ transplant may well have exceeded 400,000 cases (310,000 cases of kidney transplants, 90,000 cases of liver transplants). If we remove the 30,000 cases performed prior to 1998, on average, 24,700 cases of liver transplants were performed each year, grossly exceeding the number of death-row prisoners. Given the tissue type matching rate of 6.5 per cent, at least 160,000 healthy donors were needed for tissue matching for kidney transplants and 100,000 for liver transplants. During the past 15 years, 2,150,00 donors – at a minimum - should be in the organ reservoir. Such a large number simply does not match the number of death-row prisoners. Even if the tissue matching rate were as high as 20–30 percent, as said by the CCP, 46,700 live, healthy donors – again, at a rock-bottom minimum, as we believe that reservoir was far higher - were needed in the organ reservoir. 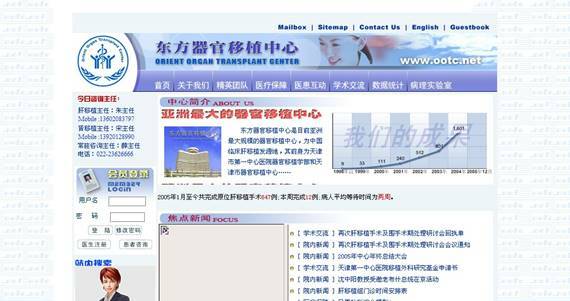 The largest organ transplant center in Asia, Orient Organ Transplant Center in Tianjin First Hospital, shows on its website that in 2005, 647 cases of liver transplant were performed and the average waiting time is only two weeks. The website was later removed but the cached pages can be found on the Internet. Figure 2 Statistics of the Orient Organ Transplant Center show the waiting time is two weeks. It is well known that Chinese hospitals are eager to make the sale, but the fact is that such guarantees are only possible when there is a large living renal source bank available on demand. WOIPFG conducted phone investigations of over 1,000 doctors who perform organ transplants in mainland China, sampling across 30 provinces during March and December in 2014. The investigation reveals that almost all the hospitals capable of organ transplants are still aggressively expanding their business and commonly express that they have sufficient donors, young, healthy donors providing live, high-quality organs. In addition, the waiting time is extremely short. Many doctors promise they can obtain a matched organ within one to four weeks. Liver transplants only takes a month and never longer than two months. Kidney transplants take a week and never longer than one month to find a HLA-matched donor. Although all donors are selected through strict examinations, the surgery will be canceled if an abnormality is found in the donor. The transplant center is responsible for selecting new donors for such patients and treats them as a priority and conduct a transplant again within a week. The statistics from the hospital itself shows that the average waiting time is two weeks. The application form for liver transplants indicates that the average waiting time for liver transplant is one week and the shortest time is four hours. Its website claims that “It is guaranteed a healthy kidney can be found in the shortest time”, “the shortest cold and warm ischemia time”, “the only organ transplant hospital with donors looking for recipients”, “we have the confidence for successful transplant as long as the doctor agrees to perform a kidney transplant”, “if not successful, we will keep trying until a success” so on and so forth. Such warrantee can only be based on extremely large live organ reservoir. Urgent liver transplants refer to patients with serious liver problem and on the verge of death. Usually they cannot survive more than 72 hours. Therefore, urgent transplant surgery needs to be performed. Due to the difficulty of urgent tissue typing, it is extremely difficult to perform an urgent liver transplant in other countries since the waiting time for a donor is too long. However, in China, there are as many as 1,150 cases of urgent liver transplant before 2006. Such a large number of urgent liver transplants indicate the existence of killing based on demand. As judiciary procedures should be followed to execute those who are sentenced to death, such as the confirmation of the Supreme Court and the specific time for execution, those who received death penalty can only rarely meet the 72-hour timeframe of urgent liver transplants. Two surgeons, Fu Zhiren and Ma Jun from the Second Military Medical University-Affiliated Shanghai Changzheng Hospital’s Organ Transplant Department, mentioned in an article titled Prognostic Effects and Treatment of Emergency Liver Transplantation for Severe Hepatitis that they performed 120 cases of emergency liver transplants in the 3-years pan from 2003 to 2006. The organ recipients were severe hepatitispatients, and their average survival time after admission into hospital was three days. They claimed: “Only emergency liver transplant procedures could be performed, with the shortest time between admission and surgery being only four hours.” We must conclude that there exists a live organ donor bank near this hospital. ZhengShusen, from the hepatopancreatobiliary surgery department(a key laboratory under the Ministry of Health for multiple organ transplantation research)at the First Affiliated Hospital of Zhejiang University School of Medicine, mentioned in a research paper that from January 2000 to December 2004, the hospital performed 46 emergency liver transplant operations. All of the patients underwent orthotopic liver transplant operations within 72 hours of being admitted to the hospital. Our investigation also found that the average waiting time for liver transplant elective operations was 1–4 weeks. That is, there is hardly any possibility that patients will die due to the lack of organs. The liver transplant registration system only records part of the liver transplant statistics and only collected the statistics for 8,486 cases of liver transplants. According to Huang Jiefu’s report, 10,555 cases of liver transplants have been performed in China during the same period of time. Thus, the number of urgent liver transplants could be larger. Many hospitals can conduct simultaneously several to dozens of kidney and liver transplant operations on the same day. It would not be possible to find so many executed prisoner donors with matching tissue typed organs, strongly suggesting that there is a large number of living donors banks, with blood types, and leukocyte _HLA histocompatibility antigens types all tested in advance. In April 2002, the organ transplant center of the whole army was set up. This Center has a record of completing 12 kidney transplantations in one night. On Sept. 29, 2004, the Director of the Medical & Educational Department, GuoJiwei, led the leaders of the medical section officials visiting operating rooms and coordinated with the hepatology section, started 5 liver transplantations. Qilu Evening News reported Li Xiangtie, the Director of Department of Urology, on March 21, 2005: "Under his leadership, the Dept. of Urology has many talents and a strong technical force, and can simultaneously take 6 kidney transplants operations and has created a national record of conducting 16 renal transplantations continuously within 24 hours. And has done 7 transplantations perday 6 times, 32 cases in 1 week. On Jan. 17, 2006, the Fuzhou General Hospital simultaneously did 3 liver transplantations for the first time. Feb. 18, 2014, at 12 o'clock, in the next 17 hours, 16 hepatobiliary surgeons completed 5 liver transplantations without sleep or rest. This hospital can complete 12 kidney transplants at one time. As of April 2007, it completed 313 cases of renal allograft transplantation, among which there were 28 times when 6~9 renal transplantations were being done simultaneously. The official website of the Affiliated Shanghai Changzheng Hospital of the Second Military Medical University says that within 9 days from Apr. 22, 2005 to Apr. 30, the organ transplant center at the hospital had done16 cases of liver transplantation and 15 cases of renal transplantation. On Apr. 6, 2005, under the command of Director Shen Zhongyang, the organ transplant center completed 5 liver transplants on patients who were 12 years to 62-years-old, including a female Korean patient and a 12-year-old child with Wilson disease. In August 2000, on the same day and at the same time, completed a large scale of organ transplantation activities including 10 cases of renal transplantation, 1 parathyroid transplantation and 3 cases of corneal transplantation. Once simultaneously did 2 liver transplantations and 5 kidney transplantations. The hospital has the capability to carry out 6-7 simultaneous transplantations, with yearly operations amounting to more than 200. In the morning of Sept. 18, 2003, Huang Jiefu attended The Third Xiangya Hospital of Central South University’s "Hunan provincial engineering research center for transplantation medicine" founding ceremony. The transplant center at the hospital on that day "arranged" 7 liver and kidney transplantation operations. In The Second Xiangya Hospital of Central South University, it is often the case to do more than 10 operations in 2–3 days.They have successfully completed 9 kidney transplantations in one day. On Dec. 27, 2007, Director QuQingshan’s team at the renal disease and organ transplant Center, completed 13 kidney transplants in 21 hours. Mar. 14, 2006, the Guangzhou daily reported: “In recent days, at The First Affiliated Hospital of Sun Yat-Sen University operating rooms, reporters witnessed a scene of simultaneous operations of 5 liver transplantations, 6 renal transplantations... At one time the hospital transplant center did 19 kidney transplants in one day, and the highest record for liver transplantation is 6 operations together with 1 multiple-organ transplants in one day. On Dec. 29, 2005, the Dept. of Urology completed 7 renal transplantation operations. From the morning of Dec. 28, 2004, to the morning of Dec. 28, in less than 24 hours, the First People's Hospital of Foshan City completed 5 kidney transplantations and 2 liver transplantations. On Feb. 1, 2002, completed one liver and four renal transplantations in 14 hours. The Renal Allograft Transplantation Center was founded in 2001. The kidney transplant center can accommodate 12 kidney transplant patients at the same time. They could do up to 8 cases of kidney transplants in one day, and the transplant center's Urology director Li Honglu has carried out over more than 500 cases of allogeneic kidney transplantation. On Apr. 26, 2002, did 6 kidney transplantations within 24 hours. On Oct. 27, 2002, did 5 cases of renal transplantations within 24 hours and 1 liver transplant. From Jan. 9 to 12, 2004, within 3 days, did 10 cases of renal transplantation and 1 liver transplant. In the morning of Mar. 23, 2006, from 3:00 am to 9:00 am, completed 4 renal transplantations. July 17, 2006, from 3 pm to 1 am the next day, with the Third Branch of Surgery Dept., the Urological Surgery Dept. successfully completed 5 cases of kidney transplantation in 10 hours. Director of Urology, Yue Zhongjin, led the department and battled to complete 8 cases of renal transplantation in 32 hours. Official website said nearly 100 cases of orthotropic heart transplantations were completed in the recent 5 years and created the record of finishing 4 heart transplantations in the same day at the same time. Once did 5 cases of renal transplantations in one day. On Apr. 28, 2006, the organ transplant center finished 17 transplantation operations in one day. 7 late-stage uremia patients underwent kidney transplant surgery. On the same day they also finished 2 liver transplants and 8 corneal transplants. Xinhua.net reported on Feb. 7, 2005, in Tianjin, Orient Organ Transplant Center at Tianjin First Central Hospital finished 108 cases of liver transplantation in the first month of this year (2005) (4 to 5 liver transplantations every day if 5 working days per week is counted) and 43 cases of kidney transplantation. Some patients' families told the “Phoenix Weekly”, the transplantation center once conducted up to 24 cases liver and kidney transplantations in one day. Orient Organ Transplant Center is capable of doing 9 liver transplantations and 8 kidney transplantations simultaneously. In February 2002, theurological organ transplant center was set up. In the next two years, the center did kidney transplantations for 260 patients inside and outside of the military. Once they continuously did renal transplant for 4 patients in 8 hours. From Aug. 2, 2004, at 3 pm until Aug. 3 at about 2 am, in 11 hours, successfully completed the 6 cases of kidney transplants. In the First Affiliated Hospital of Zhejiang University School of Medicine, the nurses at the renal transplant ward said: "One day at the end of 2006, more than 30 kidneys came in, more than 10 people were shot in a day." On Jan. 28, 2005, Academician ZhengShusen at the transplant center completed 5 liver transplantations consecutively on the same day. ZhengShusen did 11 cases of orthotropic liver transplantations in a week. Yan Lvnan: Can carry out 3~5 liver transplantations on the same day at the same time. Once we did 7 liver transplantations in a day. A Huaxi Hospital nurse said, in a recording:“Once they did 6 kidney transplantations in a day. The kidney resources are abundant. In the evening of Feb. 10, 2004, 4 liver transplantations were finished, mastered by the head of the hospital, Chen Guihua. On Jun. 24, 2005, did liver transplant surgeries for 3 patients. Liver transplant center leader Xia Qiang cannot count himself on exactly how many liver transplant surgeries he has done. He can only remember his own record of 6 liver transplant surgeries in one day. On July 16, 2014, “Jinan Daily¡° introduced Wang Hongwei, director of the kidney transplant section. He once completed ten kidney transplants in one day. Tan Jianming, the director of Shanghai Organ Transplant Medical Center Clinic at Shanghai Jiao Tong University School of Medicine, personally performed more than 4,200 kidney transplants. In 2003 Tan Jianming at Shanghai First People's Hospital did a kidney transplant for a patient. In the next two weeks, they tried to do blood and other matching tests from four kidneys with the patient. Due to the patient's antibody response, no matching kidney was found, and four kidneys were taken away. The patient then returned to his own country, and came back to the hospital after about two months. The hospital used four kidneys to do similar tests when eighth kidney turned out to match, and smooth completion of the transplant was finished. Dr. Tan told the organ recipient that the eighth kidney came from a convict. According to reports on websites www.wlmqwb.com and www.sina.com.cn, in the afternoon of Sept. 28, 2005, while accompanying LuoGan, the then-Secretary of the CCP’s Central Politics and Law Committee, in attendance of the 50th anniversary celebration for the establishment of Xinjiang Uyghur Autonomous Region, the then-Vice Minister of Health Huang Jiefu demonstrated a transplant operation at the First Affiliated Hospital of Xinjiang Medical University. Huang used two living persons as spare livers for his operation. After Huang Jiefu opened the abdominal cavity of a liver cancer patient named Yao Shufa, he discovered that his liver happened to meet the criteria for an autologous liver transplant, which he had dreamt about performing. Huang Jiefu’s operation lasted from 7 pm on Sept. 29 to 10 am on Sept. 30, after 24 hours of observation, Huang announced the operation was successful; the spare livers were no longer needed. In 2006, PRC’s Ministry of Health released "Specifications for technical management of liver transplantations" which requires that liver cold ischemic time should be less than 15 hours, therefore, the two spare livers brought from Chongqing and Guangzhou could only be two living persons. Otherwise, even just counting the 40 hours after the procedure to concluding if autologous transplants has succeeded, a liver cut early in advance should have failed for sure. Typically, death-row executions are governed by strict requirements. Personnel from the courts and Prosecutor's offices must be present, the execution can only be performed after the prisoner is positively identified, check-ups are required also after the execution. In Huang jiefu’s operation, Chongqing and Guangzhou hospital personnel were able to walk with spare livers on airplanes, strongly suggesting that the living persons (donors) are special prisoners outside the judicial system. WOIPFG’s investigation has confirmed that around Mar. 9, 2006, when the Sujiatun operation was exposed, there was a period of surprise, followed by expedited transplantation procedures. Many hospitals throughout the country suddenly had a lot of organs and medical personnel working overtime to catch up on organ transplants. When Sujiatun incident was exposed, some hospitals in the northeast part of China were surveyed and said they had received instructions to temporarily suspend organ transplant surgeries. But after less than 20 days, that was, on March 27, the Ministry of Health issued “the provisional regulations on human organ transplant technology and clinical application management” and determined to be implemented on July 1. After that, hospitals and major transplant centers around the country not only restored the organ transplants but also the number of operations increased significantly. Many hospitals across the country indicated that in April or May, there would be abundant organ donors. After that, it would be very difficult to get donors. At that time, WOIPFG’s investigations covered 23 provinces and autonomous regions, which meant that the Communist authorities expedited its actions in eradicating Falun Gong practitioners, in large numbers, who were used as organ donor pool, and the orders for this action came from the CCP. Among them, the Hunan People's Hospital and even launched a commercial ad to give out “20 cases of free organ transplantations” (10 liver transplantations and 10 kidney transplantations), which indicated that the organs would be destroyed if not used, and they might as well exploit the situation by using it as an advertising opportunity（see the website snapshot below). People's Hospital of Hunan province in 2006 "double program" (ten free liver transplantations, ten free kidney transplantation. Working overtime in the first three months of 2006 and have made 300 cases of renal transplantations. Whereas they only made 360, 260, and 160 cases in 2003–2005. Doctors in the hospital said that Falun Gong donors in April 2006 would be more available.The donors were now becoming gradually more. The investigation in May 2006 showed that a couple of months ago, Li Honghui from the Kidney Transplant Center at Yuquan Hospital, the Second Affiliated Hospital of Tsinghua University, was transferred to Chengdu, Sichuan, where there were more kidney donors, to assist the hospital for kidney transplantation. Director Xu Yahong at the hospital acknowledged that in May there were a lot of donors. Both men acknowledged (using) Falun Gong practitioners as donors. In 2006, recently there was a group of (donors) in the mid-late April. (Falun Gong) practitioners are healthier, the kidneys were all from young (practitioners) aged 20–30, without infectious diseases, AIDS, or syphilis. There were many donors on April 11 and 12, 2006. In 2006, a doctor said, “If you wanted to do it, it would be this Thursday. We would have a large number of donors on Thursday, on in the month of April. We will have them this week and next week and the week after the next week! In early May 2006 to the end of June, now we have donors. … Get over here now, (we can do) both liver and kidney transplantations at the same time. Doctors said, kidney resources were rich. There would be live donors next Monday (April 11, 2006) aged 25-30. (Liver transplants): “Get here as soon as possible, we did it on Saturday. April 2006, there are many donors, several groups next week. … We do close to 100 cases a year. Come as soon as possible, Saturday, and Sunday would be all fine. As for the donors mentioned by the doctors in the investigation, we used to consider them to be organs, like many readers. Yet while writing this report, prompted by Huang Jiefu’s operation in 2005 in Xinjiang, where he used two living persons as spare donors for liver transplantation while he conducted autologous liver transplantation, we reconsidered. The state media reported them all as spare livers, and considering the facts that they usually wouldn’t know when the patients arrive and the need that the patients must be matched with the (tissue/blood) types, we believe here that the “donors” mentioned by most hospital doctors were in fact, living human beings who were stationed nearby. They could be killed at any time for their organs according to the results from the blood/tissue type matching with the patients. Dr. Pang Yubin, based on the above evidence and his own research, said that China currently has the "inverse matching" in organ transplantation, which is different from the rest of the world. Other countries have the so-called direct matching, where the patients in need of an organ have to wait for several years before finding a donor. However, China has inverse matching, where the organs wait for the organ recipients. Many Chinese hospital websites clearly state that a living donor can be found within a week. It is very difficult for us to obtain more evidence from those secret concentration camps [where Falun Gong practitioners are being held] because of the Chinese regime’s information censorship. However, blood tests done on Falun Gong practitioners, whether they are locked up in jails, labor camps, detention centers, or even at their own homes, indirectly confirm that the Chinese regime is building a database based on reverse organ matching. In addition to the extensive physical and mental abuse, Falun Gong practitioners from all over China are being forcibly subjected to blood tests while they are being detained. A large number of Falun Gong practitioners, who are locked up in jails, labor camps, and detention centers, have suffered different abuses. Some were beaten, some were injured, others have become crippled or passed away (According to Minghui.org, a total of 3,861 deaths have been confirmed for practitioners, who were beaten to death.) They have all been subjected to blood tests, and they do not know the results of the blood test. If they are really sick, they cannot get any medical treatment. Neither can they post bail to seek medical treatment. All of these different treatments are common practices throughout China. Other than Tibetans, Uyghurs and some House Christians, none of the other detainees or inmates receives such treatment. Since April 2014, there have been cases of officials from the public security bureau and police breaking into the homes of Falun Gong practitioners and forcing them to have blood tests in Guizhou, Liaoning, Hunan, Hubei, and Beijing. When they couldn’t find Falun Gong practitioners, they forcibly withdraw blood from their relatives. Many of these cases took place in Guizhou and Liaoning, and some police even said they were simply carrying out orders from their superiors. In Dandong, Liaoning Province, alone, there are a total of 16 Falun Gong practitioners, who have been forced by the local police to have their blood drawn. “The Epoch Times” April 5th, 2006 report, titled “Medical expert: There exists a large live organs’ warehouse in Sujiatun”. “The Epoch Times” Sept. 19th report, titled “The police in Dandong claimed that Falun Gong practitioners forced to take blood test is mandated task – Terrible secret hidden behind”.